The Chromebook is a hugely popular choice for Education. They are affordable, easy to use and easy to control and monitor in a classroom environment. Their battery life is improving all the time to try to provide a full day of charge. It’s no surprise that more and more people are choosing Chromebooks. They also provide a valuable resource for enterprise, with companies encouraging grab and go. Eliminating the need for staff to have personal laptops this encourages the use of Chromebooks on a daily basis. In London this is proving particularly popular with workers travelling in by train. Of course this means that it’s important to ensure that your Chromebooks are charged and easy to access. There are many different ways to do this depending on your needs and structure. A trolley is the best solution if you need to transport your Chromebooks around from one space to another. There are three different sizes available to take 16, 20 and 32 Chromebooks. All of the power cables are secured inside the trolley so these can’t go walkabout and its super easy at the end of the day to just return the Chromebook to the shelf and plug it in. In addition zioxi Next Generation Chromebook trolleys also have zioxi Onview. There are many features provided by OnView to help you manage your devices remotely using a WebApp. With OnView you can set and manage charging schedules choosing the most environmentally friendly times to charge, you can check to see if the door is safely locked at the end of the day and view usage reports. Helping you to ensure that your devices are being managed correctly. If you don’t need to move your Chromebooks around then a static solution is the best choice. Floor standing cupboards are available for quantities of 16, 20 and 32 and can be positioned in the best location for daily access to the Chromebooks. 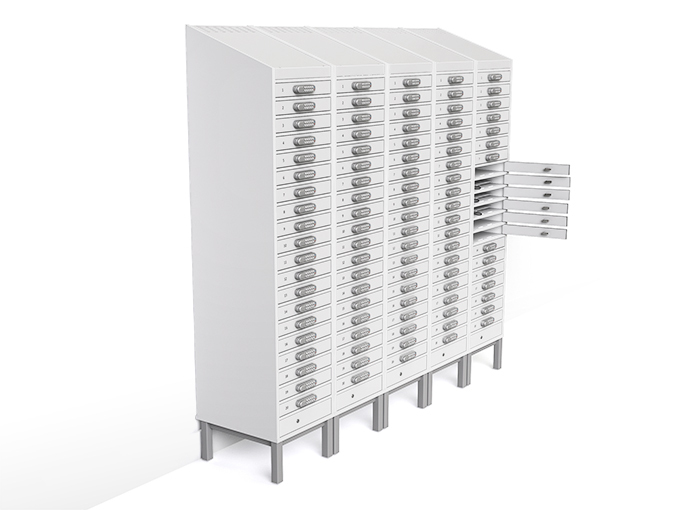 For smaller numbers of Chromebooks you may consider a table top cabinet for either 10 or 16 Chromebooks. Lockers are perfect for 1:1 schemes where a user has their own designated Chromebook. This can then be locked away in their own locker compartment at the end of the day. All of our products come with a choice of either key, code or RFID lock. So you can choose the right combination that best suits the intended use. Please contact us for more information about any of our Chromebook Charging Solutions. Our bestselling lines are held in stock and available on a 3-5 day lead time.